When will the Canadian Citizenship Rules become Law? 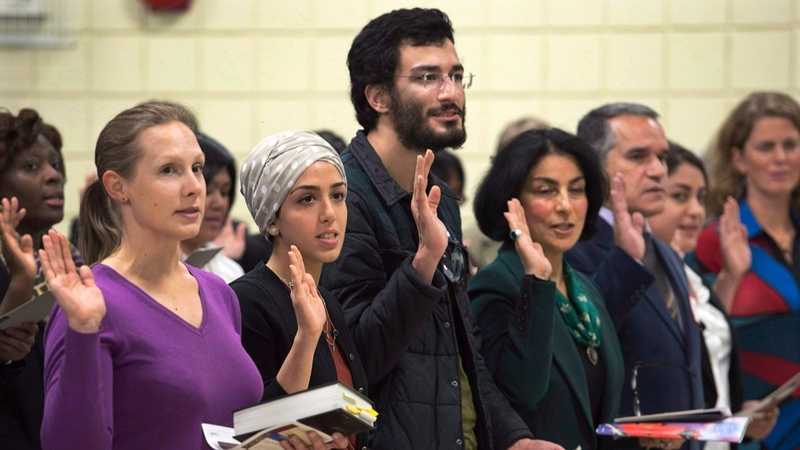 New Canadians take the oath of citizenship at a ceremony in Dartmouth, Nova Scotia. It’s been some time since the promised changes in the citizenship rules started on its path towards becoming law. Bill C-6 has been working its way through the legislature since February of 2016. So here we are – What now? The bill’s sponsor, independent Sen. Ratna Omidvar, championed in particular an amendment, introduced by independent Sen. Elaine McCoy, that improves due process for people who are facing revocation of their citizenship due to fraud or misrepresentation. After the Conservatives’ Bill C-24, revocation processes were streamlined such that people weren’t automatically granted a right to defend themselves if their citizenship was about to be taken away. The Liberal Bill C-6 didn’t reverse this change. Previous immigration minister John McCallum had told senators Liberals would “welcome” an amendment addressing this, but new minister Ahmed Hussen has not indicated support one way or the other. 2) Minors can apply for citizenship, separate from parents and guardians. It has been a long time coming, but we are cautiously optimistic that the Liberal governments will accept the three amendment, so the citizenship bill C-6 can finally become law. This entry was posted in Canadian Citizenship, citizenship and tagged citizenship act, Citizenship and Immigration Canada. Bookmark the permalink.